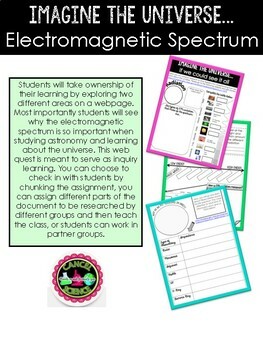 Students will take ownership of their learning by exploring two different areas on a NASA website. 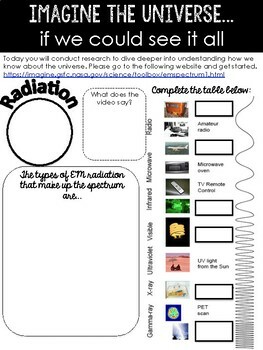 Students will see why the electromagnetic spectrum is so important when studying astronomy and learning about the universe. This web quest is meant to serve as inquiry based learning. You can choose to check in with students by chunking the assignment, you can assign different parts of the document to be researched by different groups and then have students teach the class, or students can work individually or in partner groups. 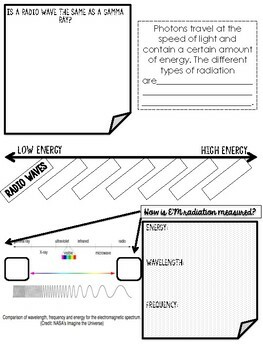 The information is easy to access and students loved searching for the information. Please let me know if the digital links do not work for you, and I'll edit the activity and have it back to you asap. Thank you for your purchase.